As many of you may or may not know, Beckam has a couple of severe food allergies. He is extremely allergic to both eggs and peanuts. We carry epi-pens and benadryl literally everywhere we go. Luckily we have never had to bust out the epi-pens - mostly because I am the most paranoid helicopter mom when it comes to food being around him. We became aware of this when he was only about 8 months old. And luckily we were out of state and weren't at home... because we live an hour away from a decent hospital. We were visiting my farmer's aunt, and she had made a delicious baked stew. Beckam had been introduced to most all of the foods in the stew already and shown no problems at all with anything. There was a fake meat product in it (containing egg whites and soy), but I decided to blend it all up and figured he would be fine. I had him sitting on my lap, facing away from me toward the table. After he had a couple of bites, he refused to eat anymore. My farmer's aunt snagged him so I could eat, and as I looked up at him I immediately noticed that his lips were quite swollen. I knew immediately that it was an allergic reaction. He was still breathing fine, but it was obvious that his tongue was a little swollen also. We made a phone call to our friends pediatricians after hours nurse, and she told us to head straight to the ER, which was just about 2 miles away (score!). Looking back on it, the ER visit probably wasn't necessary, but it made me feel more comfortable. His airways were never blocked, and I have to assume this is because he didn't actually eat much. I'm not sure if it itched his mouth or what... but if he had consumed more, it could have been much worse. I originally thought that he was allergic to soy. And was honestly shocked when we got his blood test back and it was eggs instead. Peanuts... yea. Pretty typical, and I wasn't too shocked even though no one in both of our families has any food allergies. It is fairly easy to identify a food with peanuts in it. And easy to use almond butter as a replacement. But eggs... the worst allergy ever! I mean, everything has eggs in it. Most all baked goods are a for sure no-no. Mayonaise, and everything that has mayo in it (lots) - eggs! Some totally random foods that you would think are ok - eggs! Moral of the story - all foods have eggs in it. Or at least that is how it seems when you are eating out. 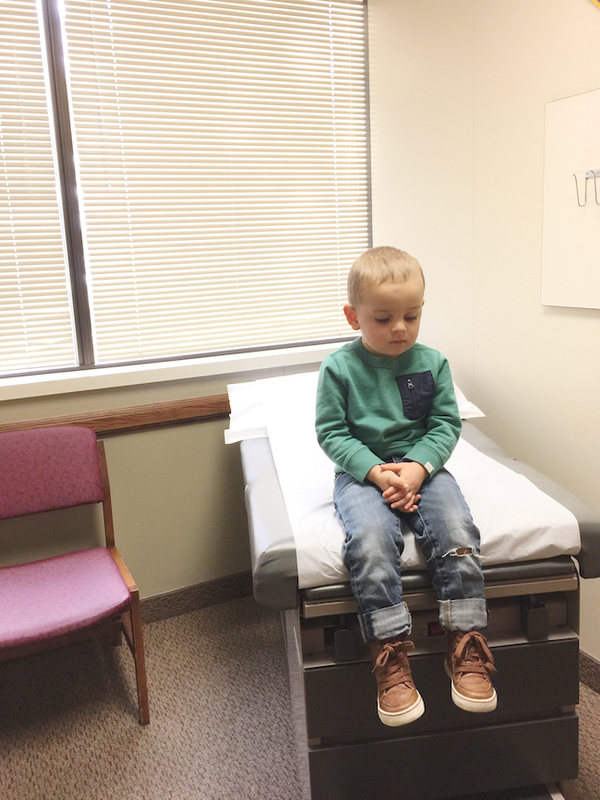 Monday I took him back to the allergist to get him retested. I was hopeful that we could at least start introducing Beckam to baked eggs, since that allergy is more common that they grow out of. He is still very allergic to eggs and peanuts both. The swelling around the egg prick was a couple of mm larger than the peanut prick even. Praying like crazy that he doesn't pick up and eat a random cupcake left behind by some kid at a birthday party. I have learned how to bake quite successfully without eggs. You can check out my post HERE to see my most frequently used egg replacer. If you have any allergy related questions, don't hesitate to ask. I am kind of learning as we go, but am feeling much more knowledgable. Poor little dude! That's so scary! My daughter did have an egg allergy as a toddler, but she did grow out of it. It sounds like you are handling it quite well! Goodness, poor baby! Thank you for posting this! Does he have any outdoor or animal allergies? 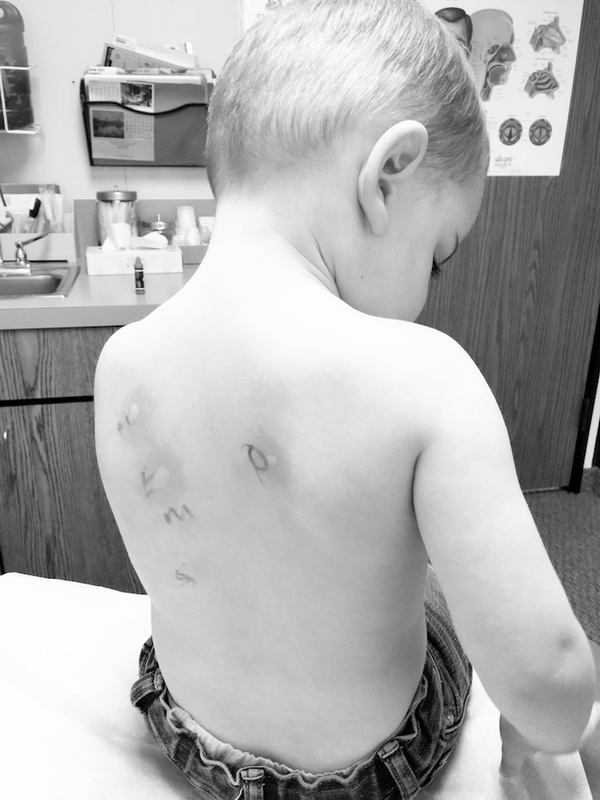 Our allergist won't do any sort of testing until our son is 5 because he needs a full panel. He is constantly miserable but I know it could be worse if he had a food allergy now like he did as a baby. Yikes! I've always been allergic to peanuts and most other nuts. I was super worried that my kids would be allergic, but luckily they aren't. I did have a scare last month where I accidentally ate some kind of nut and woke up in the middle of the night with my lips and face swollen. Here's to hoping Beckam and I both grow out of our allergies. Bless his heart-and yours! That's a tough allergy to have! Poor kid, I have food allergies as an adult and it's hard enough. I hope that he grows out of it! 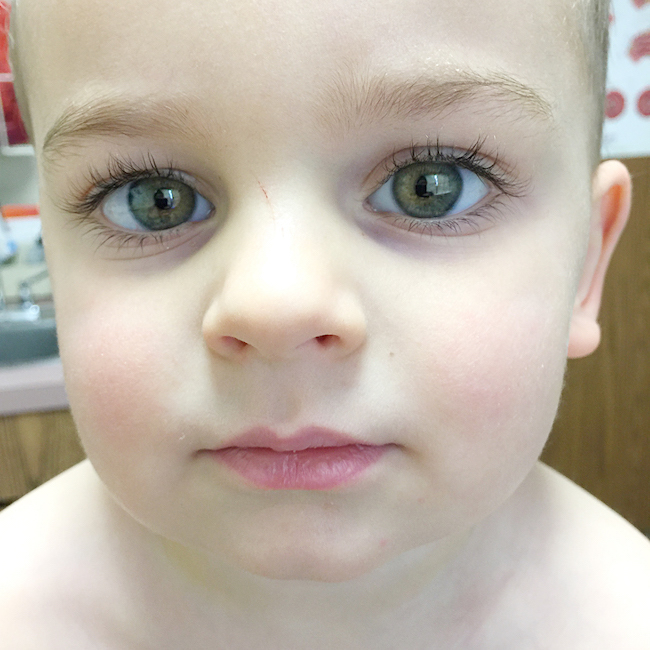 My son was told he was allergic to egg whites and a bunch of other stuff when he was a toddler. He grew out of all of it (He's 15 now). Hopefully your son does too! Poor little boy. That picture of him sitting on the hospital bed just breaks my heart. Is he starting to develop an understanding that he can't have eggs? It will be much easier to think about when we know he can take control of what goes into his mouth. So sorry this beautiful beautiful child has to have this hassle. Reading these other people's comments about other kids eventually growing out of it is nice to hear. Hopefully, that will be the case with our boy. Oh my goodness, my heart breaks for that sweet face! I have a friend whose 1 yr old son is severely allergic to dairy, eggs, nuts and soy! It's definitely a learning curve, but she has learned to deal with it well! There's a company called Enjoy Life Foods that makes baking mixes and snacks that are completely allergen free: no eggs, no nuts, no dairy, no gluten: all safe! Hopefully poor Beckham will grow out of at least some of the severity, but until then, you're doing a great job, mama! Oh my, how scary!!!! My dad was allergic to eggs, chocolate and chicken and he grew out of all of them. Fingers crossed the same is for your lil man. I know exactly how you feel!!! mine is allergic to whole eggs [luckily he can eat baked goods], all nuts and all fish! 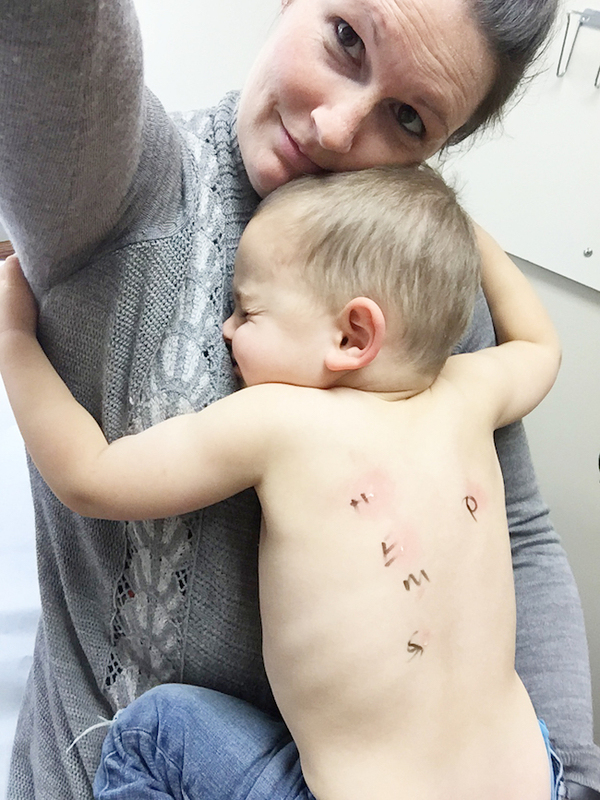 We ended up in the hospital with anaphalatic shock when he was 14 mo. old with tilapia. We, too, are Epi pens for life. My son is now 3 1/2 yrs. old so we need to retest! Hopefully he grows out of them soon!! So sorry to hear about your son and all the trouble he is going through. I have a peanut allergy myself and I have had some serious problems in the past, eating peanut containing foods unknowingly. It really is scary when you struggle to breath and your skin turns to this red color. Freaked me out the first time. Thanks.